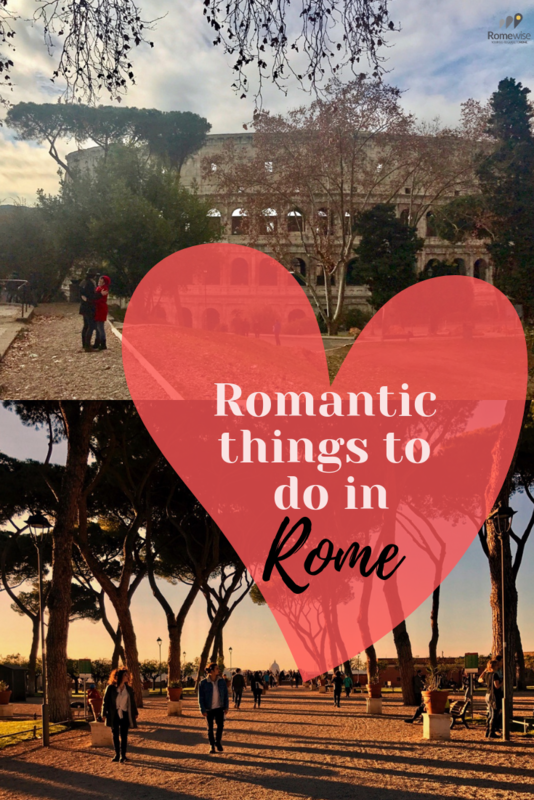 Wondering what are some romantic things to do in Rome? I think Rome is a pretty romantic city all by itself, don’t you? If you are looking for some special things to do, ways to make your visit to Rome even more wonderful, you will need to choose wisely. This is what the top of the Spanish Steps is usually like, and at night, even more so. The view is lovely, but it's not very private. Many of the romantic things to do in Rome are also popular. This includes sights, restaurants and views. So it can be a bit jarring, especially in the busy season, to think you’ll go have a nice romantic moment someplace, only to find yourself surrounded by other chattering tourists. I have a few ideas about Romantic Things to do in Rome (bottom of the page.) I did marry a Roman so I know a thing or two about it! I thought I’d also check in with some of the other fantastic Rome experts I know: Rome/Italy bloggers and writers who know Rome oh so well. They have generously agreed to share their secrets with us! 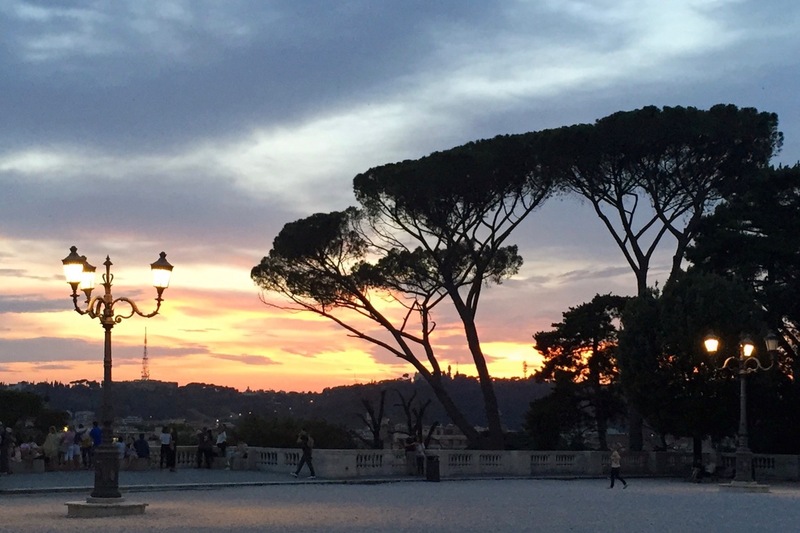 These are their favorite Romantic Things to Do in Rome, in their own words. They are all equally fabulous, so this is in no particular order. You have places to eat and drink, hidden romantic symbols around Rome, hints for where to have spectacular views, and suggestions for how to spend a whole romantic day or evening in Rome! You won’t get much more insider info on Romantic Rome than this! Australian-born travel and style blogger Joanne Bergamin has been living and working in Rome for the last twelve years, most of them inside the Vatican, where she worked as a journalist for the Pope’s newspaper, L’Osservatore Romano. "Our recent evening at Mirabelle Restaurant (atop the Hotel Splendide Royal) far exceeded our expectations. They spoilt us with the corner table set with fresh flowers on the 7th floor terrace. Even through the rain we had a clear view over the sparkling city lights all the way to St. Peter's dome. Executive Chef Stefano Marzetti came out to greet us and then went back inside to create a menu just for us - incredible! Oysters, prawns, champagne . . .just for starters. 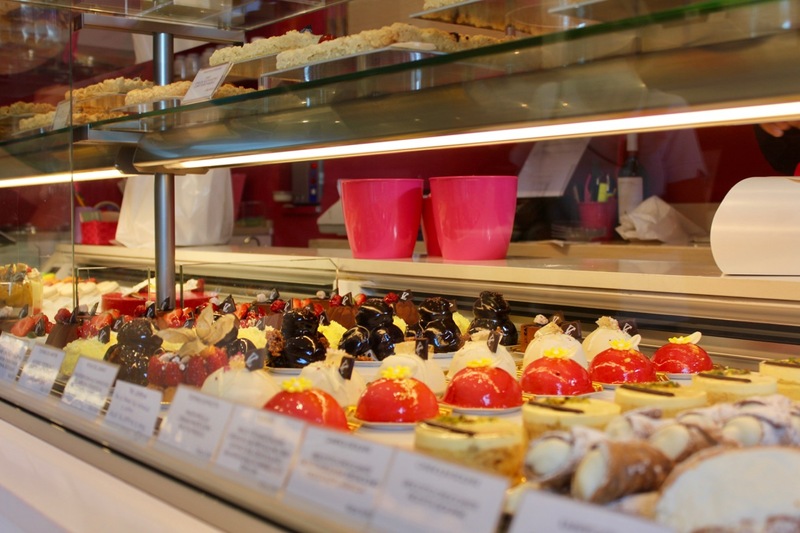 I don't know how we squeezed in the desserts, but there's always room for chocolate!" Chiara is the publisher of the most widely followed Italian blog about Rome, A Day in Rome. Follow her on Instagram if you want to see the most exclusive shots of everything Rome, as she is always invited to openings of sites and events before they open to the public. Her blog is in Italian, but you can translate with Google, and her photos speak for themselves. 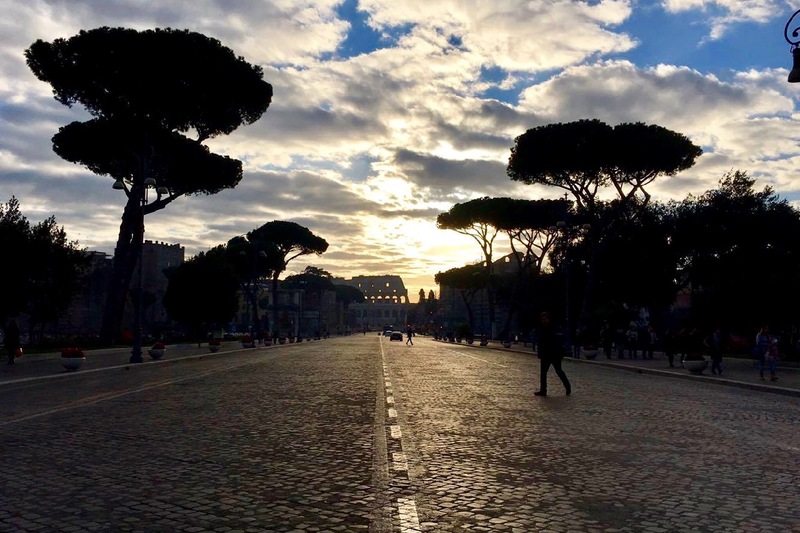 "Stroll alongside the Complesso Vittoriano, towards the via dei Fori Imperiali. Head up to the right passing the Risorgimento Museum, the museum on the side of the complex that houses splendid exhibitions of contemporary art. Then, go down to the Belvedere overlooking the western branch of the Roman Forum . . ."
". . . To the right, you can almost touch the Triumphal Arch of Septimius Severus, symbol of Ancient Rome. A few meters from your shoulders, stands the Mamertine Prison, the oldest in Rome: Two superimposed levels of caves dug at the southern foot of the Capitol alongside Gemonian stairs . . ."
". . . Rome rushes along the imperial artery, not far from here. Cars work out their shocks on the cobblestones, the mopeds buzz by without peace, sellers sell, the Centurions flatter to get pictures. You will not hear anything of this chaotic mosaic. Embrace each other in silence, lost in the landscape of the Roman Forum. Let yourselves go. It will not be an ordinary kiss, just like any other. It will be The Kiss!" Livia is a travel writer, photographer and culture enthusiast with a penchant for la dolce vita and a severe case of wanderlust. She writes about Italian culture and lifestyle on her website and has been published in The Independent, Forbes, Fodor's and USA Today. "I love going to the Teatro dell'Opera di Roma to see a ballet or an opera: with red velvet seats, frescoed ceilings and gilded details, the whole atmosphere is so beautiful and stepping inside the theater transports you to a different era. 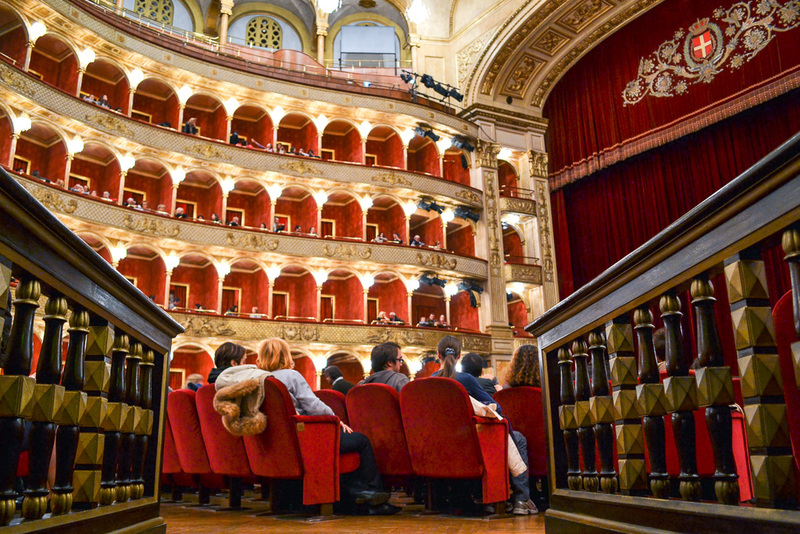 Tickets are also really affordable compared to other opera houses in Italy, especially if you opt for gallery seats in the upper tier, so there's no reason to miss out on this special experience!" "Madre must be the sexiest restaurant in Rome. It has a sleek bar area in the entrance, perfect for a romantic aperitivo in the evening, and a lush indoor garden in the main room. Although I love rustic trattorias, it's hard to look good slurping a big bowl cacio e pepe so I appreciate the creative menu here too. At Madre, you'll find gourmet pizzas, ceviche and savory maritozzi, plus an excellent list of cocktails." 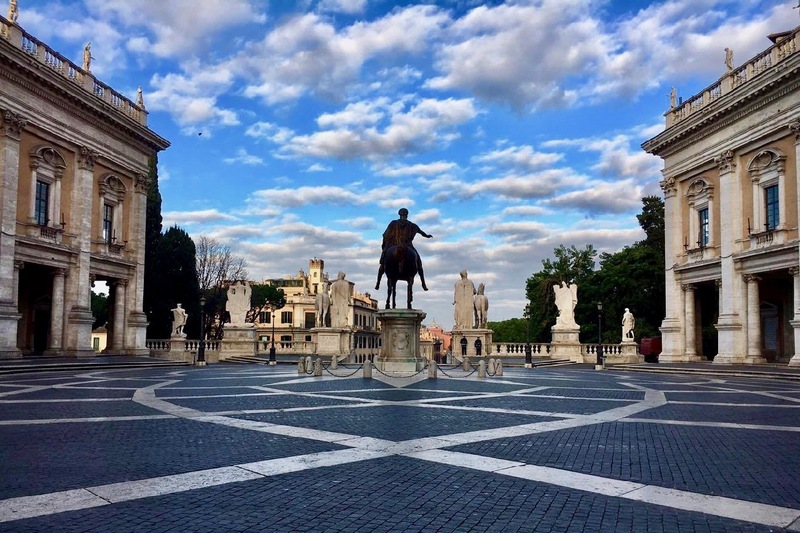 "One of the best kept secrets in Rome, Terrazza Caffarelli is located right beside Piazza del Campidoglio and the Capitoline Museums but lies largely overlooked by tourists. 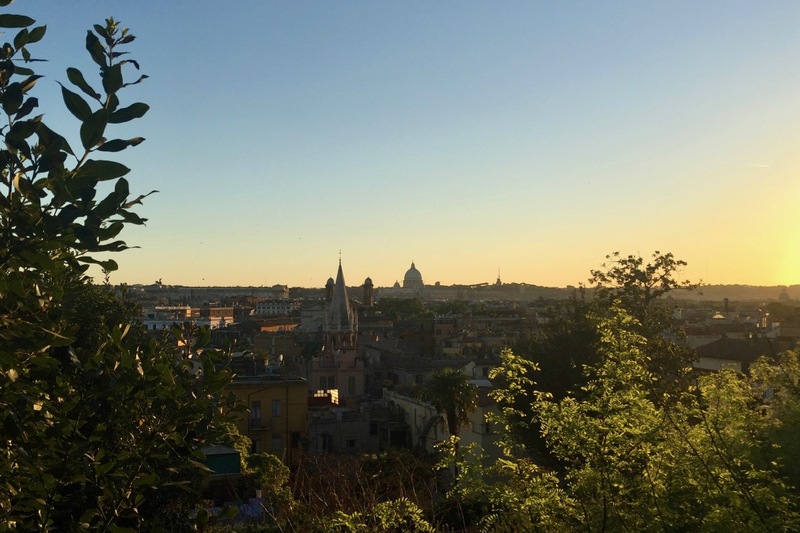 It's one of my favorite places to catch the sunset and has a wonderful view of the domes of Rome - without any crowds." Elizabeth is a best-selling author, longtime Rome resident and Rome expert, and publisher of the foodie blog Elizabeth Minchilli in Rome. Elizabeth also has some wonderful food apps all about Italy! 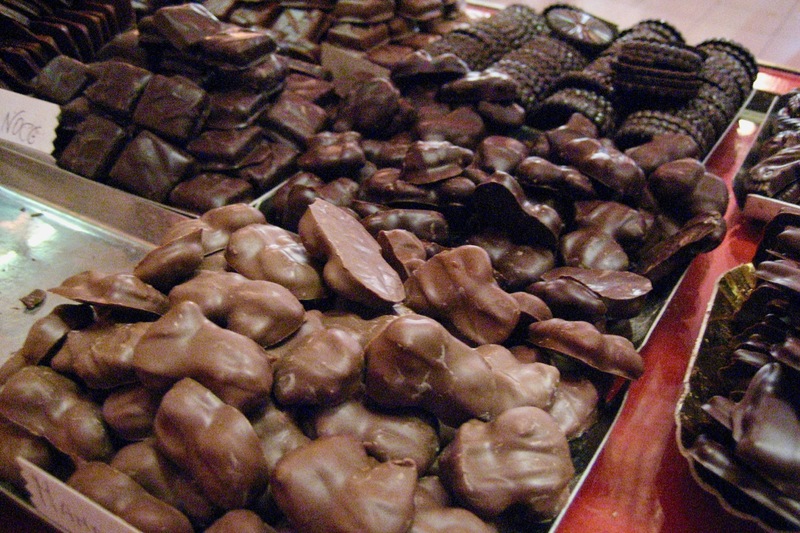 "One of the most romantic things I can think of in Rome is stopping by my favorite chocolate shop, Confetteria Moriondo e Gariglio, and choosing chocolate for my valentine . . . "
" . . . Although they have oodles of heart-themed chocolates, I like to go old school. 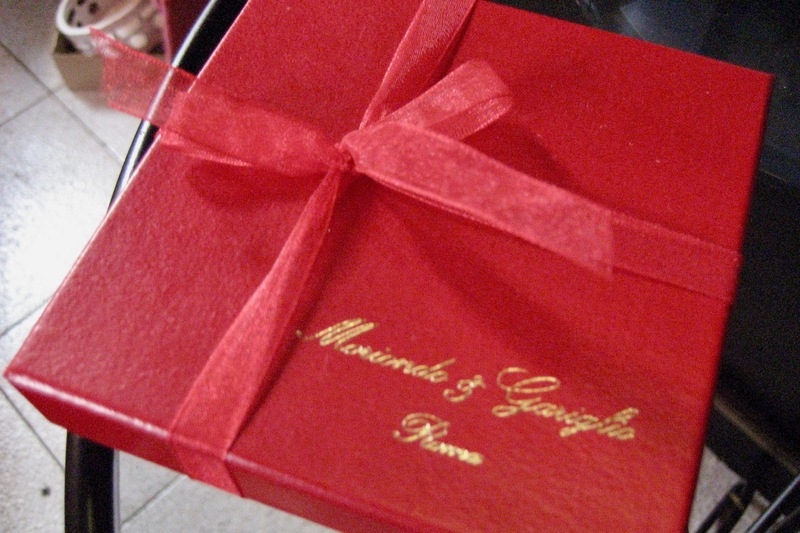 I choose my size of red ribboned box, they line it with gold foil, and then I start choosing which hand made chocolates should go in. There is something about putting together my own choices that I love." Rick Zullo is an American who has lived many years in Rome, and publishes the popular blog Rick's Rome. He is author of several eBooks all about Rome and Italy, and has his own podcast to boot! 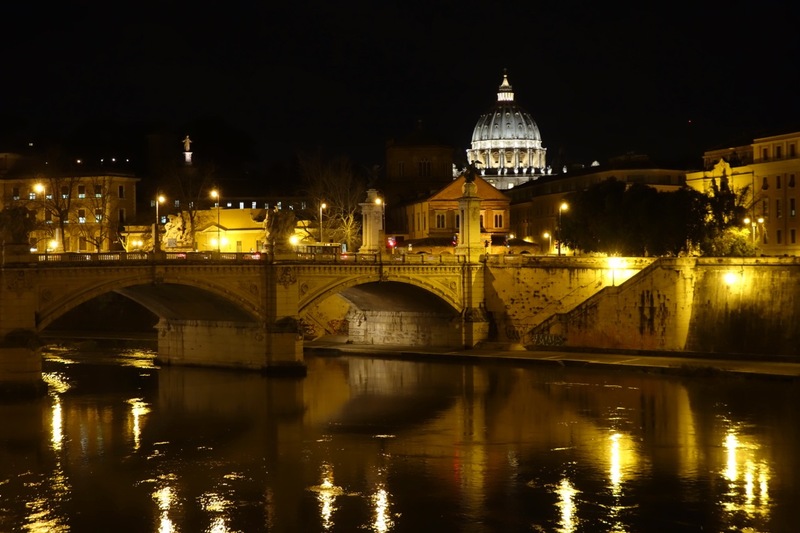 "One of my favorite romantic spots in Rome is Castel Sant’Angelo at night. Only at night. During the day it swarms with tourists. But when they (occasionally) open it up after dark, it’s uncrowded and the evocative mood recalls furtive affairs, forbidden trysts, and tales of heroic lovers risking the dungeon in order to fulfill their hearts’ desires. . . "
Castel Sant'Angelo at night. Even gazing on it from the outside is one of the most romantic things to do in Rome! ". . . There’s even a “secret passage" lined with tiny lights that winds all the way to The Vatican, should you feel compelled to confess your sins after the affair is over. " Rick even has two posts on his blog related to our theme: Valentine's Day and Dating Rules in Italy. Diana Simon is the owner and publisher of the wildly popular blogs, Browsing Rome and Browsing Italy. "I love sunset moments and I feel that Pincio Terrace is one of the most romantic places to take in the stunning light show when in Rome..."
"...To make it even more special, head to Casina Valadier to enjoy a spectacular view over drinks and dinner that will make for an unforgettable evening. It’s an exclusive place doesn’t come cheap but you’ll have a sensational experience." Maria is an Italian-Australian living in Rome, and publisher of the wonderful blog HeartRome. Maria's writing has been featured in Fodor’s, USA Today Travel, 10Best, CNN, EasyJet, Rough Guide to Italy and more. She has recently published a wonderful book, which she calls her love letter to Rome, Heart Rome. I love it and highly recommend it! "A walk to Rome's Gianicolo (Janiculum Hill) is a must on any romantic Rome trip. While this may not be on of the official seven hills of Rome, it sure offers a spectacular view..."
" . . . The panorama of the eternal city spreads out like a postcard before your eyes and hell - if you can steal a kiss under the moonlight, this could very well be one of the most romantic spots in the world." Gian Pietro Leonardi combines a passion for art (he's content curator of Rome's Civic Museums Social Networks), literature (he publishes the blog Queerographies), and travelling. Follow his wanderings on Instagram. "I put my headphones on, Morrissey starts to sing 'I am walking through Rome | With my heart on a string' and I suddenly realize that these streets can be such a multilayered and faceted postcard of our personal and collective emotional geography. . .
" . . . St. Valentine's Day in Rome can be very queer when you're gay and vegan but it can also be fun: follow me through the streets of the Tridente as I am reaching my husband for a romantic dinner out. . . The streets in the Sant'Eustachio area are romantic to walk through any time!
" . . . Let's begin our stroll from via di Santa Maria dell'Anima (the same spot where Elio and Oliver kiss in André Aciman's Call Me by Your Name, the book) and then walk through the vicoli (little streets) of the Rioni Parione and Sant'Eustachio. Take a rest on vicolo del Divino Amore and imagine this is the place where Caravaggio lived when he got out of prison." " . . . 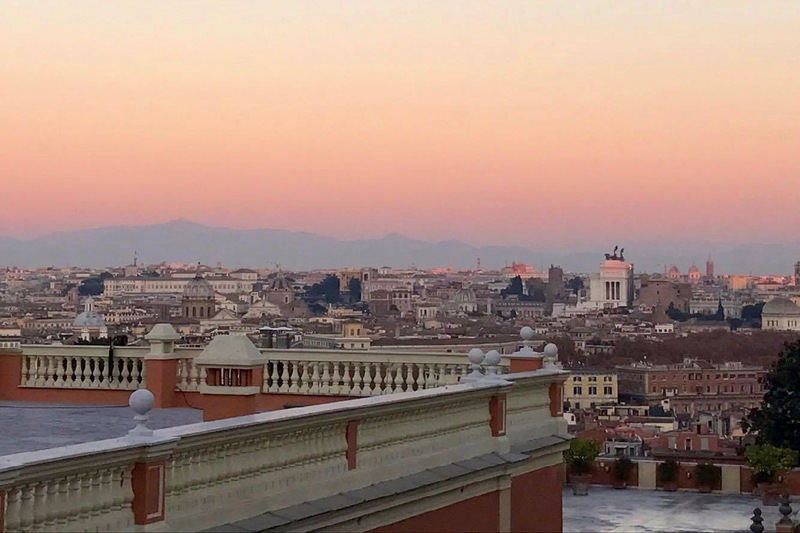 The typical pink sunset of Rome is the natural background of our walk that leads us to Piazza di Spagna (Spanish Steps) but before we reach it there is time for another stop, by the Hotel d'Angleterre, the place where Oscar Wilde stayed in 1877 when he visited 'the one city of the soul'. . ."
" . . . Wilde is still on my mind when I pass through Piazza di Spagna and my eyes are stuck by the elegant house museum dedicated to Keats and Shelley. But I don't want be late for my date: Il Margutta vegetarian food & art is the right place to spend a romantic evening with your significant other, especially when you love quality vegan food, biodynamic wines and a creative atmosphere." 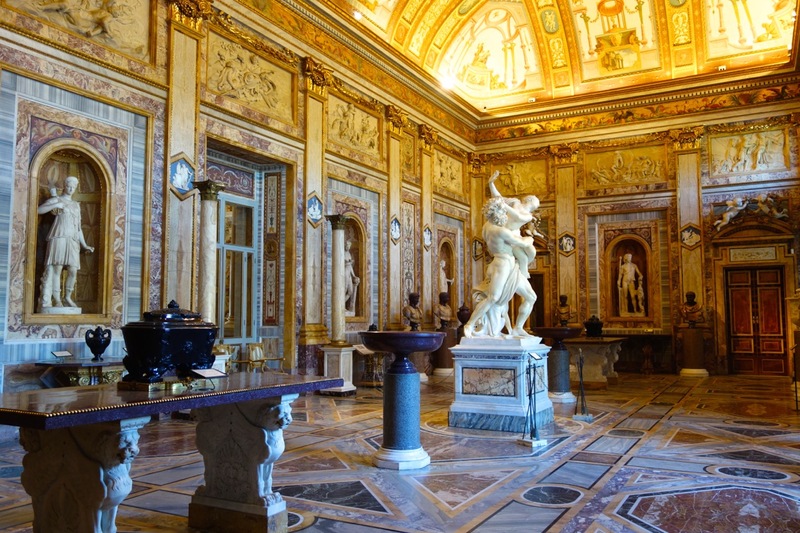 "Everywhere you go in Rome, you meet the great sculptor and architect Gian Lorenzo Bernini. The Fountain of the Four Rivers in Piazza Navona, the Triton Fountain in Piazza Barberini, the splendid statue of Apollo and Daphne in the Galleria Borghese, the cleverly designed St. Peter's Square that embraces the numerous visitors and pilgrims . . . In the square there is a stone connected to a sad love story . . ."
" . . . When Bernini worked on St. Peter's Square, he was very in love with a Roman lady. He could only think about the color of her eyes, her silky hair, the sound of her voice . . . Unfortunately, despite Bernini’s dreams, his love was unanswered. Moreover, Bernini had to focus all his time and energy on the major papal project; there was no time for love. Bernini hid as a sort of antidote to his broken heart into the pavement of St. Peter's Square. You’ll find his broken heart close to the marble plate with the wind (Libeccio) north of the obelisk . . ."
Eleonora Baldwin is a TV host, journalist, author and culinary connoisseur based in Rome, Italy. Her ﻿writing appears in several food and travel publications. Her show “ABCheese" is broadcast on Italian food network Gambero Rosso. Eleonora’s co-owned company Casa Mia Italy Food & Wine designs custom epicure Italy vacations for food and wine lovers. "I believe in day-long dates. Dinner and a movie don’t work for me, I need to be charmed, entertained, knocked off my feet. And on a full stomach. 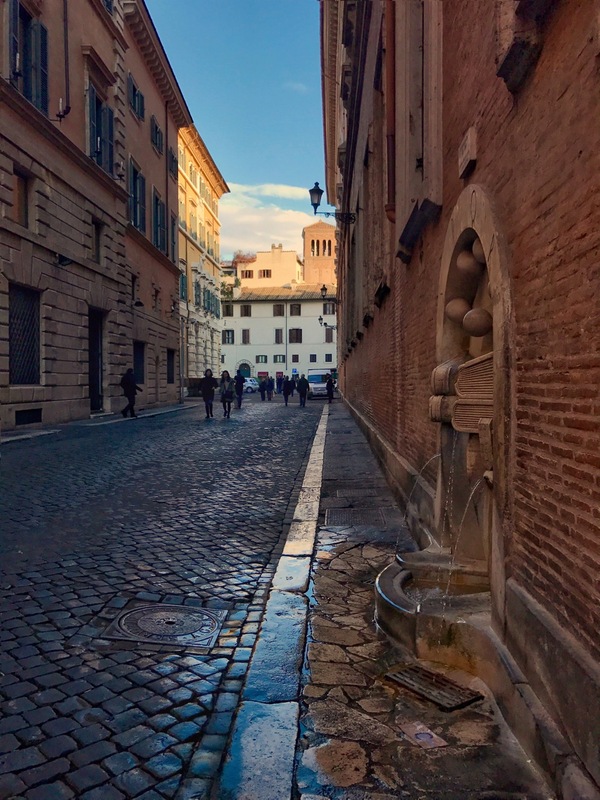 In my book, a romantic Rome jaunt should include idyllic, sappy and picturesque spots for a full day of romance, with pitch-perfect mood, food and ambience. Meeting place: Giardino degli Aranci, an orange orchard on the Aventine hill, located next door to the city’s most famous keyhole..."
"...Leaning over Rome’s most romantic balustrade is for tourists. I much prefer a private watercolor/sketching class for two. Sketching Rome Tours does a magnificent job. Your teacher will provide all materials, you remember to bring the ice bucket and the bubbly. Renting a vespa and kissing on Ponte Sisto just as the sun dips behind the Renaissance skyline is so Roman Holiday. Nothing beats the romance of that languid, pink-tinted panorama. Church bells chime, sparrows dive overhead and hearts skip a beat..."
"...If zipping on two wheels is not your idea of flirtation, book a couple’s wellness treatment at a spa, like Argileto Piccola Metro Spa, or AcquaMadre Hammam. Now, pampered and relaxed, twin-step over cobblestones to reach Trastevere. Climb up the steps and take your seat at a candlelit table at Romolo nel Giardino della Fornarina. 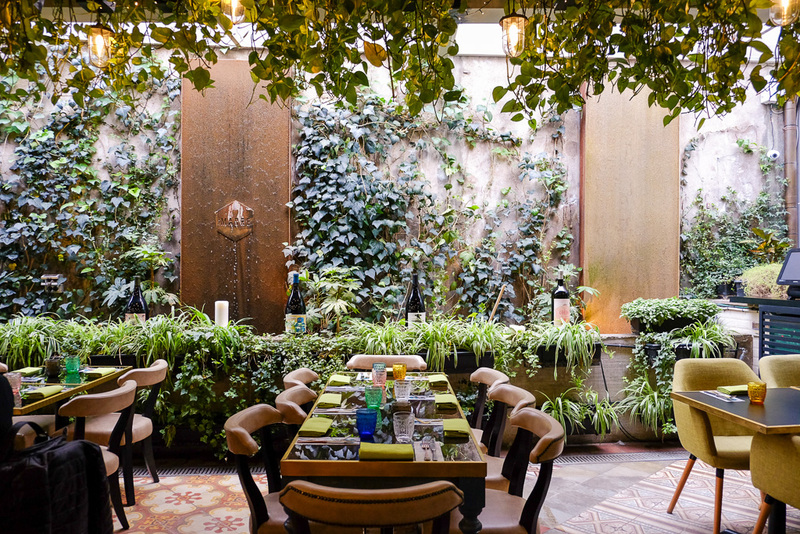 Margherita Luti and Renaissance artist Raphael met in secret in the walled garden above Porta Settimiana that now houses a handful of tables for two. Flickering candles, history-encrusted walls, refined cucina romana and the Rome twinkling stars above. Enough to say, “Yes"? " 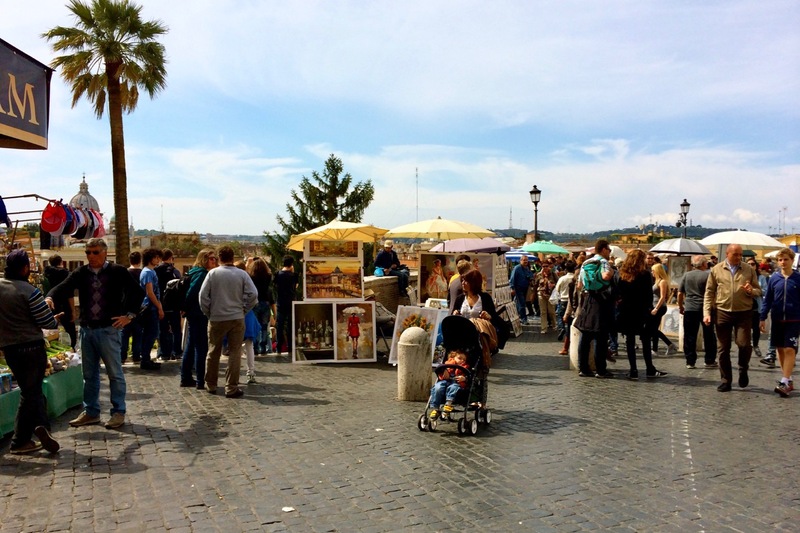 Gillian publishes the wonderful blog Gillian's Lists, with all kinds of insider info on fun things in Rome. As stated on her blog, she is an "information curator, traveler, coffee and cocktail drinker." She is the "go-to girl for the best information on just about anything in the eternal city, the Amalfi Coast, Capri and the island of Ponza." 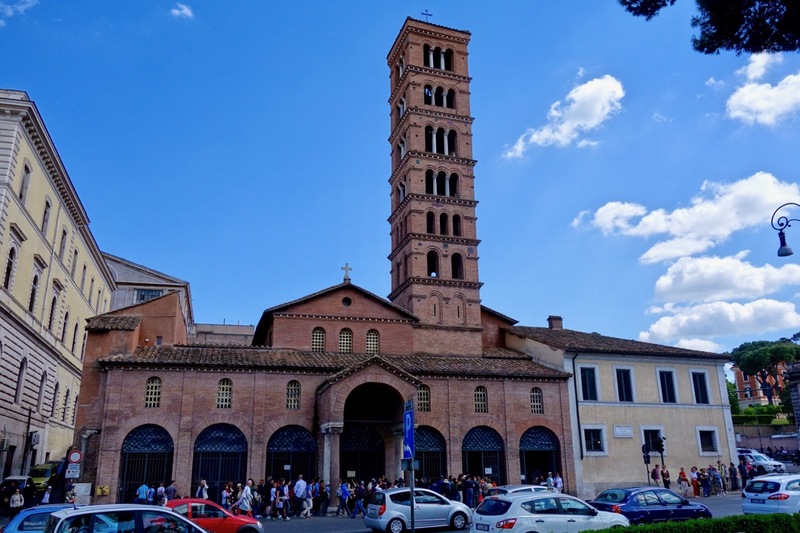 Gillian has written several eBooks, and publishes a fantastic newsletter full of great pix and writing about her adventures in Rome and other parts of Italy. She always seems to be the first to find something new in Rome! 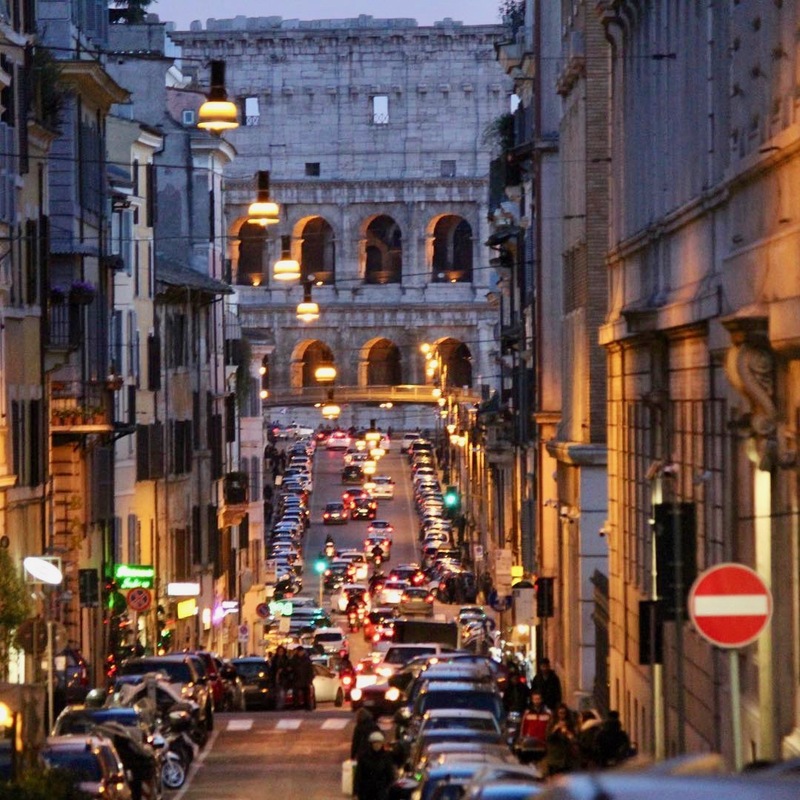 "Rome is at it’s most romantic when you feel like you have the place to yourselves. Take an early morning walk along the Fiori Imperiali stopping for a selfie near the temple to Venus (goddess of love) and Rome. "...Wind your way up to the Campidoglio and admire Michelangelo’s magnificent public square with only local police in sight..."
"...Cross over to the Circo Massimo with a stop at the tiny cafe San Teo (Via di S. Teodoro, 88) for a cappuccino and cornetto, and finally find the Giardini di Aranci on the elegant Aventino hill with a view out towards San Pietro..."
"...Have an indulgent pasta lunch with a glass of wine and decadent tiramisu at Flavio al Velavevodetto (via di Monte Testaccio) in Testaccio. 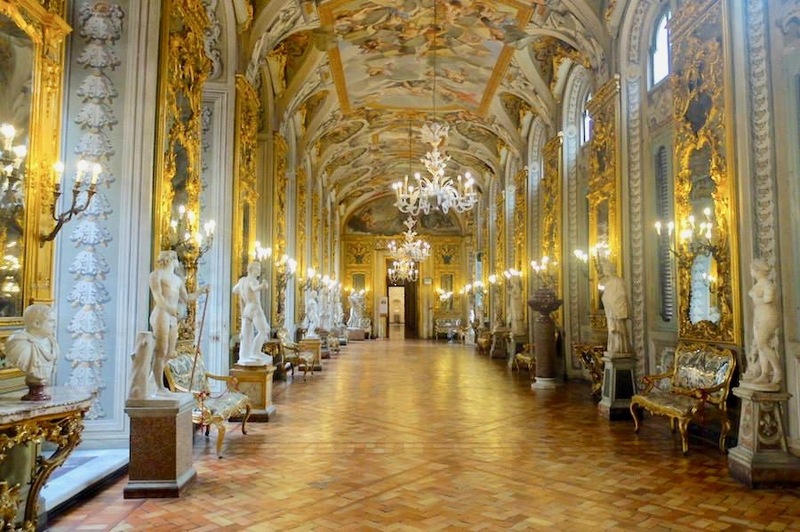 After lunch head to the Palazzo Doria Pamphili (via del Corso 305) where you will probably have the entire palace to yourselves. 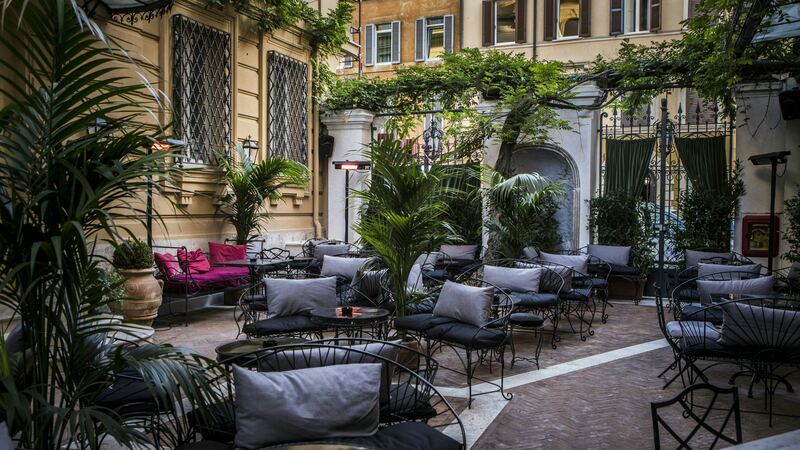 Start you evening off with fancy cocktails at the chic and modern Madre in Monti." Natalie takes beautiful photos, and has an engaging and witty writing style. In her own words: "Natalie has been eating far too much gelato in Rome since 2010. She blogs at AnAmericaninRome.com"
"Most people wait in line to see the Mouth of Truth, but few realize that St. Valentine’s skull lies just inside the same church (and there is no queue to see it)..."
The church of Santa Maria in Cosmedin with its huge queue of people waiting to put their hand in the Mouth of Truth. Head inside the beautiful church instead! "...The skull of the priest is bedecked with flowers inside Santa Maria in Cosmedin – but bones are rarely romantic. What IS romantic is the sake St. Valentine gave his life for: love..."
Linda and her husband Steve Brenner (both American) have been running the popular and wonderful Beehive Hostel in Rome for nearly 20 years. You will find Linda's wonderful blog on the Beehive website. "My husband and I had our honeymoon in Rome the year before we moved here. I consider Rome one of the most romantic cities in the world. It's a beautiful mess and sheer poetry to me. 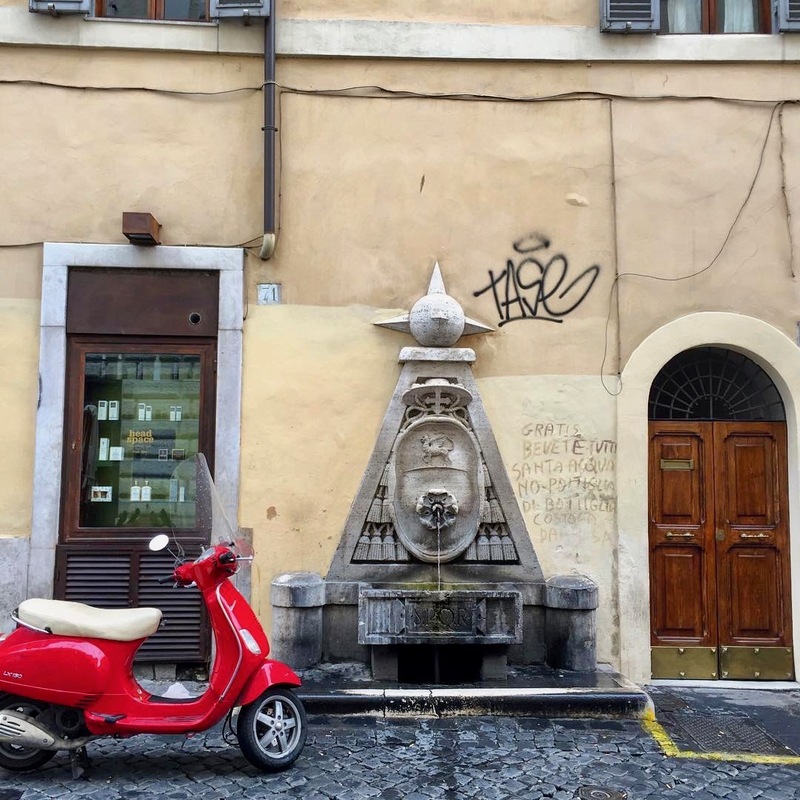 When we first moved here we eventually bought a scooter and that changed everything..."
Riding a Vespa around Rome is so romantic! - Photo by Linda M.
"...On a scooter with my arms around my husband, the wind on my face, the hum of the engine and that intangible feeling of freedom is pure romance. Zipping along under the warm golden glow of the street lamps, I feel like I'm living in a movie and even Rome's defects are captured lovingly in that magical light..."
Some prime scootering spots are the road up the Gianicolo hill in Trastevere to catch the sunset, the Lungotevere (post rush hour only), and anywhere in Rome's center especially at night. Make sure to stop by a cosy wine bar such as Al Vino Al Vino to toast your evening and hopefully many more evenings together. You can rent a scooter at one of Rome's many scooter rental companies such as Bici & Baci or Vespa Style or if you have a smartphone you can download the app and try Rome's scooter sharing service ECooltra. If you're solo, try the Uberesque scooter service Scooterino and who knows what romantic adventures lie ahead." Georgette publishes the enormously popular blog Girl in Florence. which covers lifestyle in Italy, curated travel tips all over Italy and the globe and plenty on where to eat. She describes herself as a "certifiable ‘Tuscan Texan’ living and breathing all things Florence while also traveling the world" Recently Georgette has been chronicling her story of love and romance, and marriage, to her true love Nico. Over the past few years, the couple have have spent many a long weekend in Rome. "I have such fond memories of being there almost every year on vacation with my husband. The Eternal city for me always more beautiful at night when the monuments are delicately illuminated. 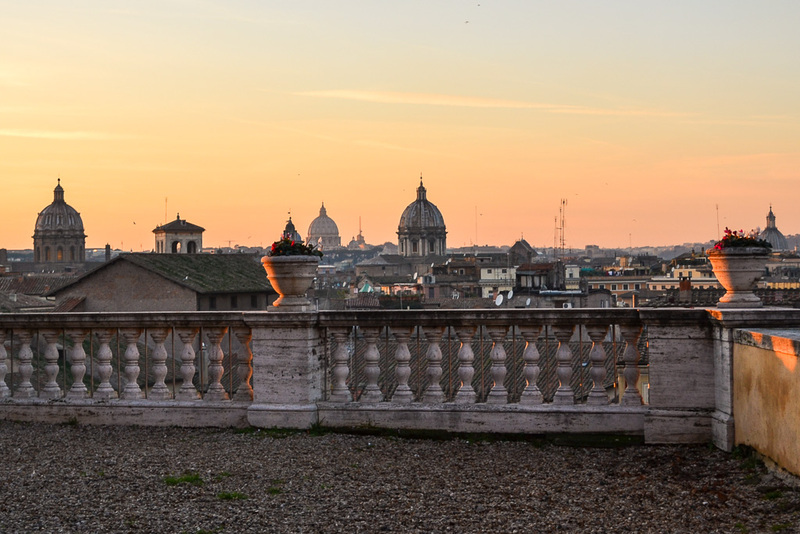 Walking home after dinner can be a breath-taking affair..."
A stroll from the top of the Spanish Steps towards Piazza del Popolo, with a stunning sunset over the city's rooftops - one of the more romantic things to do in Rome! 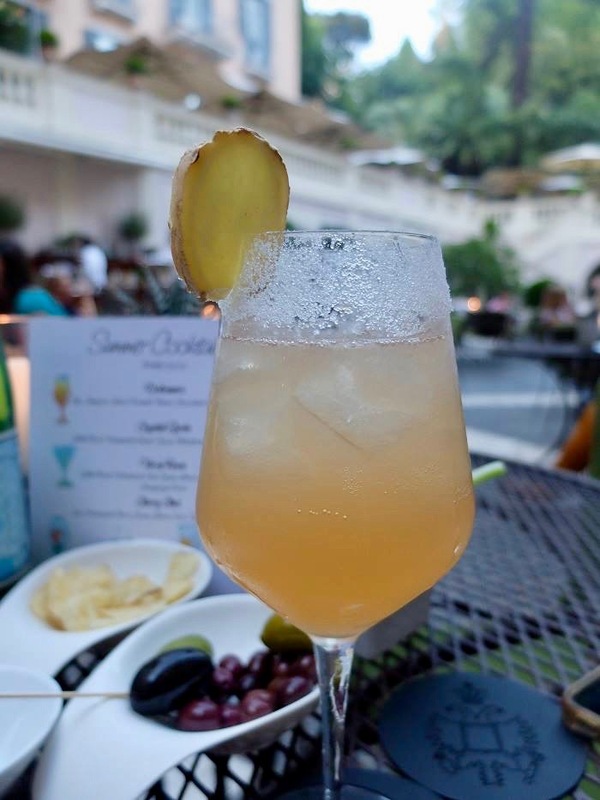 "...Ideas for romance (from a non-local) include a romantic row boat ride in the adorable laghetto of Villa Borghese’s public park (so very reminiscent of the Notebook), or a fancy drink in the picturesque courtyard of Hotel de Russie..."
Cocktail at the iconic Hotel de Russie. Photo by Georgette Jupe Pradier. ". 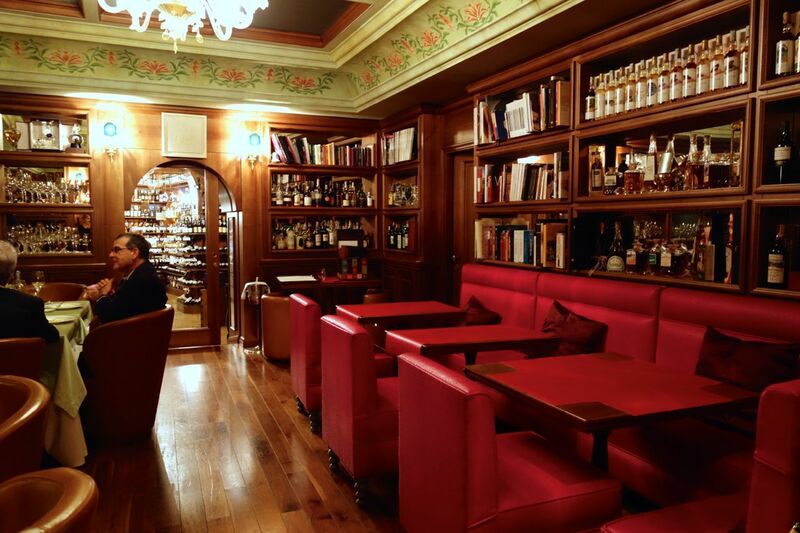 . . .wine lovers might prefer iconic wine bar Il Goccetto. Last but certainly not least is a classical music or opera show at 'hidden in plain sight' gallery, Palazzo Doria Pamphilj. . ."
Hall of Mirrors in the gorgeous Galleria Doria Pamphilj. Photo by Georgette Jupe Pradier. ". . . Throughout the year, you can enjoy a tour combined with a wonderful Baroque Concert, or, if you prefer, opera. A beautiful opportunity to enjoy one of the city’s most ornate, and interesting, historical galleries that many people miss despite its central position." As a bonus romantic thing to do, you can also get a made-to order picnic basket for enjoying in one of Rome's beautiful parks. A dyed in the wool Yorkshire lass, Catherine was enticed to Italy some years ago and has lived and worked in Rome ever since. Love for both the faults and the merits of her birthplace and new Italian hometown are regular topics on You Can't Take the Girl Out of Bradford. 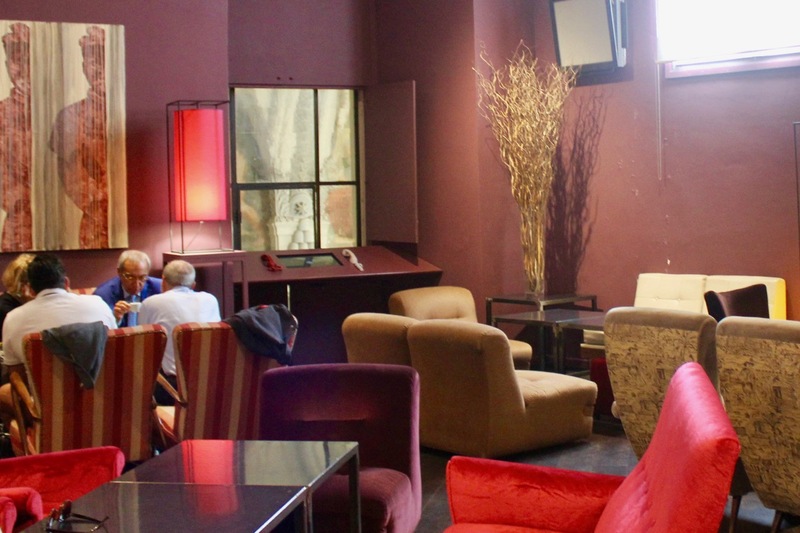 "The bar at the Hotel Locarno is a little bit of hushed luxury close to the busy Piazza del Popolo..."
"...Go there for pre-dinner drinks or linger for longer with an aperitivo – a selection of choice nibbles will accompany each drink you order. The atmosphere evokes an old style glamour which is neither stuffy or formal. I’ve had cocktails with friends here, but it’s best with a significant other. In summer there is a leafy garden courtyard with hidden corners and in winter the art-deco bar is cosily lit with a real roaring fire. Rome is a city to stroll through hand in hand - try to find a view from one of the many hills, a square or a bridge particularly at sunset. However, if your idea of romance calls for something less chaotic than the city centre, escape to the peace and tranquillity of Rome’s most ancient highway and walk back through the ages along the original Roman road, the Appia Antica..."
Strolling along the Appia Antica in Rome can be one of the most Romantic Things to Do in Rome! 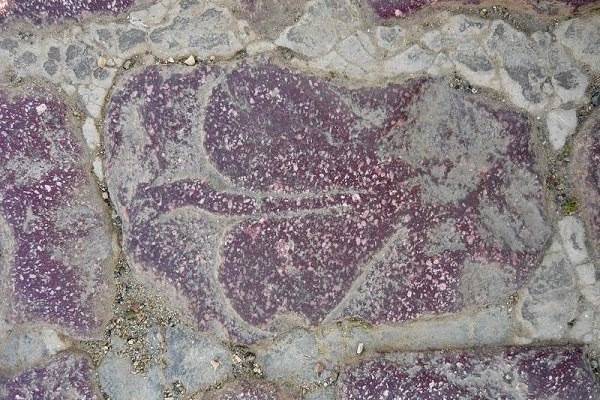 "...This tree-lined ancient stone path travels across miles of Rome’s countryside and provides catacombs to explore, ancient mausoleums and monuments and an occasional sheep along the way. Stop at L’Archeologia Restaurant for lunch and you have the pretty perfect day." 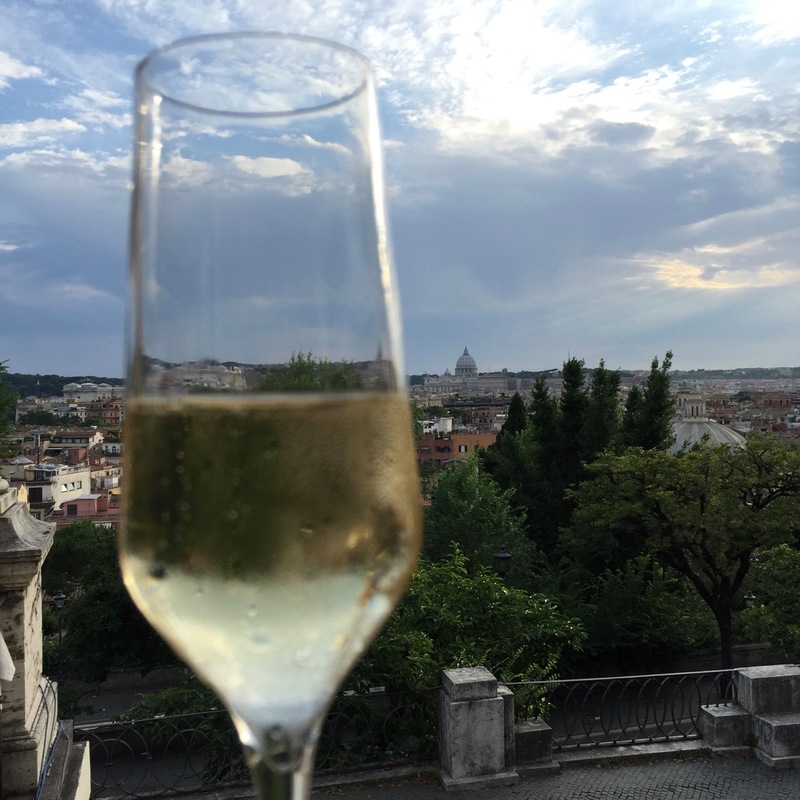 A very heartfelt thanks to all the wonderful, talented writers who've generously contributed their time and creativity to making this page about Romantic Things to do in Rome more complete. Don't forget to check out their blogs, and follow them on Instagram! They all have unique and interesting takes on their lives in Rome and Italy. Some of the writers who contributed to Romantic Things to Do in Rome provided photographs, where noted. If not credited to them or a third party, then the photos are mine. I met my husband in Rome, and had a romantic time “dating" him, and eventually marrying him here…and now of course we sometimes look for romantic things to do in Rome together. So I have some first-hand knowledge on the subject! 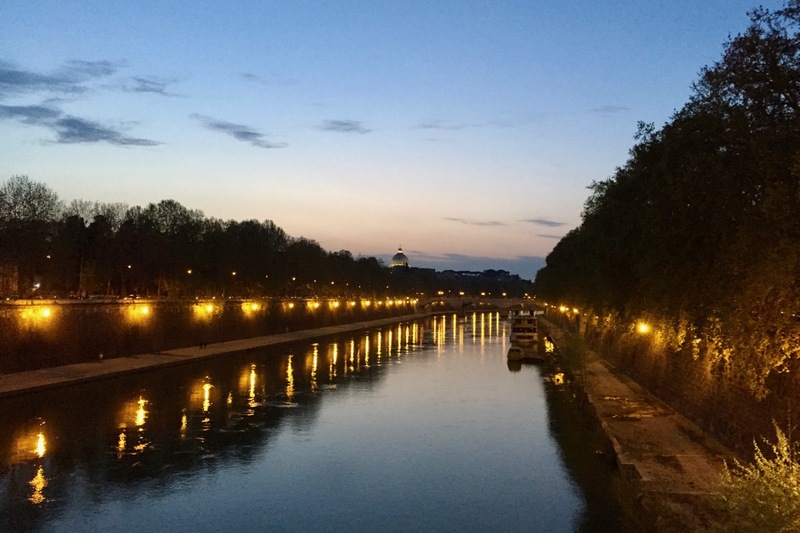 Here's a quick list of some of my favorite Romantic Things to do in Rome, to add to the fabulous insider-secrets above. Romantic place for a coffee/cocktail - Cafe in the Chiostro del Bramante with its velvet chairs and a view to Raphael's Sybills inside the church below. Romantic place for drinks with a view - Hotel Minerva knocks my socks off! One of the most romantic things to do in Rome is to catch the sunset up here (or any Rome rooftop bar). It's not inexpensive but if you're looking for something special, this is the spot! Romantic park - Villa Torlonia. I think one of the most Romantic Things to Do in Rome is visit one of the museums in this park, have a drink at the outdoor lemon tree garden, and then lay down and soak up some sun in the grass. 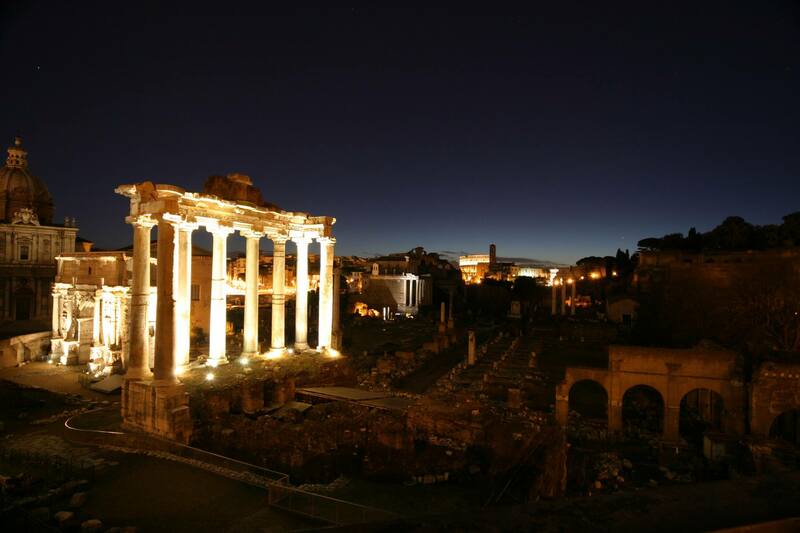 Do you have any favorite Romantic Things to do in Rome that we didn't cover? I'd love to hear from you! **Just a little note on the romantic legends about Rome (and surely anywhere) - sometimes you have to take these with a grain of salt. 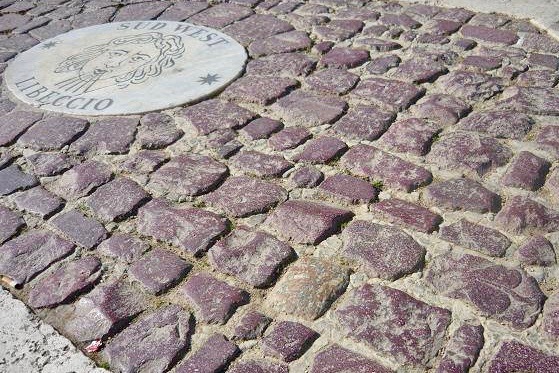 It may not be true that Bernini built a heart into the cobblestones. That may not really be Saint Valentine's skull in the church. This is often the case with legends, myths and typically with relics. Time passes, there may be no proof and well, we just don't know. So it's up to us to believe or not. 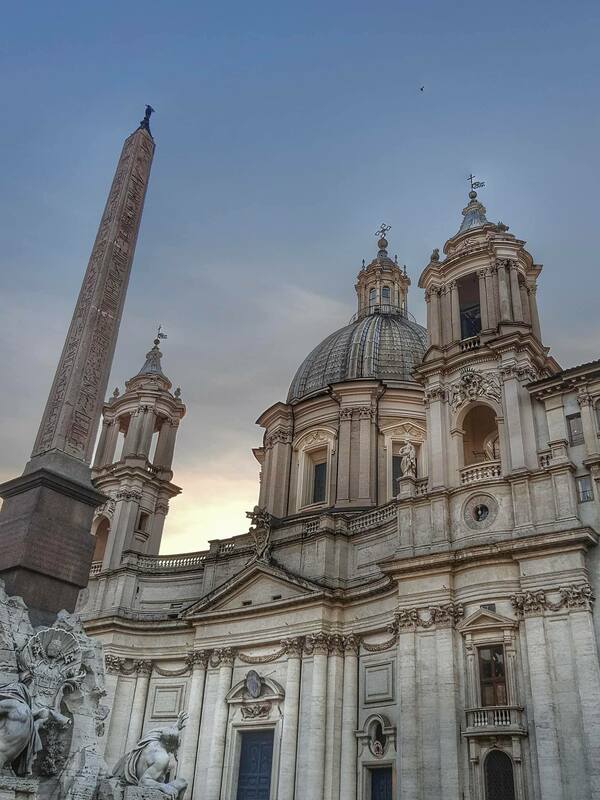 Want to share this page about Romantic Things to Do in Rome on Pinterest? Pin it here!